Clearwater and the CRC for Water Sensitive Cities hosted a visit to the Aquarevo Discovery Centre on 20 September 2017 to hear about a range of lot and precinct-scale water and energy innovations to be implemented in the new 42ha residential development in Lyndhurst, Melbourne. The event attracted around 50 participants from consulting, local and state government, the urban development sector and academia. Discussions covered water and energy innovations, the commercial and economic context for the development, customer perspectives on sustainability initiatives, and opportunities for applying innovations in future developments. 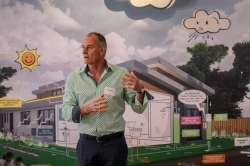 South East Water's Terry Dalgleish showcased the water and energy efficiency initiatives on display at the Discovery Centre, and described the collaborative partnership with Villawood Properties that is transforming the former wastewater treatment site. Ross Allen shared insights on the CRC for Water Sensitive Cities' (CRCWSC) early and ongoing involvement in the development, with the CRCWSC Aquarevo Case Study being launched by Kim Markell. Meg Caffin (Urban Forest Consulting) spoke more generally about the benefits of an urban forest strategy for residential developments and the importance of an integrated planning approach. Initial land releases at Aquarevo have been in extremely high demand and with civil works underway, the future of water-efficient communities is not far away. View this video below for an insight into the event and the highlights of the day.